← Did you know you can get a colour consultation for your home? Whether you're a seasoned professional or just getting started out in the business, you're probably already aware of some of the basic paint safety precautions you should undertake whenever you step onto the worksite. Here's a rundown on some of the things you should consider before you start painting. Some painters may find themselves getting dizzy when painting in confined indoor areas. This is due to paint fumes, and some people may even experience reactions to chemicals in paints. Make sure your paint zone is well ventilated so fumes can disappear quickly, reducing the risk of reactions. Also look for environmentally friendly paints that are approved by the Environmental Choice program. Look after your health and the environment by selecting low or no-VOC paints where possible, such as Resene Zylone Sheen VOC Free. It's available in a range of colours and has a waterborne finish which means it will be safer for you and the planet than solventborne products. Dizziness can also be caused by dehydration. Preparation and painting can be a surprisingly hard workout, so make sure you have plenty of water on hand and drink regularly. 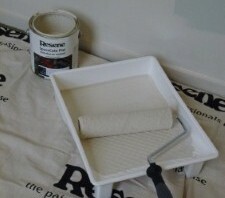 It's a good idea to cover your skin, eyes and hands when painting to avoid unnecessary exposure to the product. Many painters opt to wear the traditional white overalls, and some may also opt to wear a face mask to avoid inhaling fumes. Consider using barrier cream on exposed hands and arms – it will help protect them from the paint and make it easier to remove later. It's likely you'll use a step ladder to reach higher walls during your job. Every time you set it up, inspect it to check for signs of wear and tear. Make sure it's always free of wet paint, oil, water or any other slippery substance, and that it's erected on flat solid ground. If you put a ladder up near a door, consider locking the door so that surprise visitors don't accidentally knock you over. Also, remember not to overreach. Always keep three points of contact when you’re on the ladder – so just one hand is free to do the painting – and keep your belt buckle within the sides of the ladder. If a spot is too far away, move the ladder until it's safe for you to get to it or use a roller extension. This entry was posted in Paint, Tips for Tradies. Bookmark the permalink.